The body mass index (BMI) is an objective measurement that can be used to help people effectively manage their body weight. In order to calculate your body mass index you will need to know your weight in kilograms and your height in meters. The simple mathematical calculation involves just dividing your weight by the squared measurement of your height. One of the primary benefits of the body mass index calculation is that it takes some of the emotional factors out of decisions and judgments about weight and the need for weight loss. Because it is a mathematical formula that takes both height and weight into consideration, it truly is an unbiased means of coming up with a quantitative indicator of the presence or absence of a weight problem. Body mass index is used to indicate whether or not a person falls in a range of being underweight, normal weight, overweight, or obese. In an adult, a body mass index of 18.5 or lower is considered underweight. 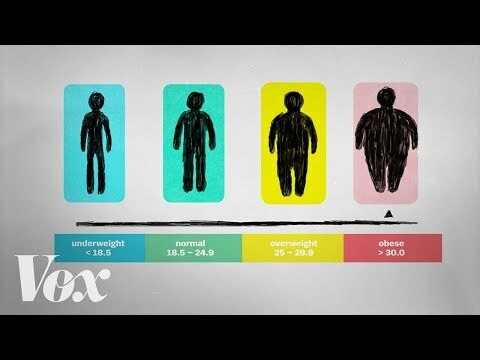 The normal range for body mass index is between 18.5 to just under 25. A BMI of 25 to just under 30 is considered overweight. Those with a BMI of 30 or higher are classified as obese, with 40 being the indicator of the presence of extreme obesity. Those whose body mass index falls in or near the range of obesity need to be aware of the health risks associated with having a high body mass index, so they can take necessary steps to reduce their risk factors. Some of the numerous diseases and conditions that are associated with a high body mass index include the following: increased chances for developing heart disease, increased risk of developing diabetes, and an increased occurrence of high blood pressure. Body mass index is, of course, not a perfect measurement. While it does take into consideration both height and weight, it does not factor in other factors that may impact a person�s health and fitness. For example, it doesn�t take athletic conditioning or muscle-to-fat ratio into conditioning. However, muscle does weigh more than fat. Therefore, a person with a high degree of muscle mass might have a deceptively high body mass index. Such a person is not necessarily at risk for health problems related to his or her body mass index. The body mass index also does not allow for considerations related to different body types, gender, or body fat percentage. Waist circumference has recently received notoriety as a key indicator for health problems associated with obesity. Research has indicated there is an association between several health problems and a person�s tendency to store excess body fat around their waist and abdomen areas. Generally speaking, men with waist measurements of 40 inches or larger and women with waist circumferences of 35 inches or larger are believed to have heightened health risks. No single measurement can paint a complete picture about management of weight or body fat, or the health related consequences associated with these issues. Still, it is beneficial to utilize these useful and telling measures when making decisions about the best weight loss program to help you obtain your overall fitness goals.